"— Your performances have spirit, thought and form." 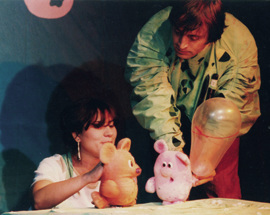 Small Puppet Theatre 'SLON' was established in 1988. During the twenty-seven years of its existence it won its place not only between the best theatre in Bulgaria, but all over the world. The Theatre has been on tours in many countries and has participated successfully in many international festivals - Canada, Cuba, Greece, Holland. Belgium, Austria, Russia. Mexico and USA. Small Puppet Theatre 'SLON' has been awarded with more than twenty (only ﬁrst) prizes for stage design, acting, director work. Small Puppet Theatre 'SLON' repertoire included the titles ‘Winnie-the-Pooh‘ after A. A. Miln, ‘Puss in Boots‘ after Ch. Perrault, ‘Happy Birthday‘ after J. Chapec, ‘The Swineherd‘ after H. K. Andersen, ‘The Bewitched Phaeton’ after Konstanty Gatchinsky, 'The Hippo and the Cat', ' Circus? Circus?! Circus!! ', 'Eden Bird' - the first water theatre in Bulgaria and Europe. The theatre has created unique stage design for and in cooperation with foreign theatres. Some of the performances by the Theatre 'SLON' were shot for the Bulgarian, the Mexican, the Hungarian, the Russian, and the Croatian national televisions.